Chapel Street in Altrincham, so called because of the Wesleyan Chapel on the corner of the road, was a road mainly occupied by labourers and lodging house keepers. It gained public recognition after the First World War for the extraordinary sacrifice of the residents. From just 60 houses, 161 men volunteered for active service, 29 men were killed. The street was honoured on the 5th April 1919 when the Earl of Stamford unveiled a memorial to the men in front of a vast crowd. 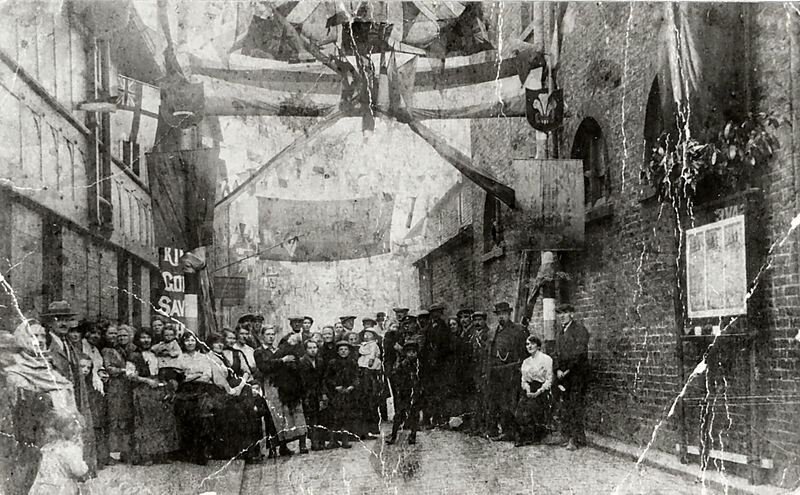 King George V sent a telegram of support which was read out at the unveiling and Chapel Street became known as ‘’The Bravest Little Street in England’’. Chapel Street was demolished in the middle of the 20th Century. Chapel Street Commemoration – Trafford Local Studies. Volunteers at Trafford Local Studies have been researching how the First World War affected the lives of the people who lived in Chapel Street both on the front line and the home front. Using archives and information from surviving family members we have been able discover more about how they lived their lives through such a difficult period. All three brothers joined up and survived the War. The eldest brother Joseph was born in Chapel Street in 1890 to parents Frank Wyatt, a builder’s labourer and his wife Ann nee Glavey. At the age of 11 he was employed as an ‘’Evening News Boy’’ and then as a jobbing gardener. In 1912 he married Florence Naylor and the couple had one son Joseph born in 1913. A family member informed me that at this time Joseph was employed as a train carriage cleaner. 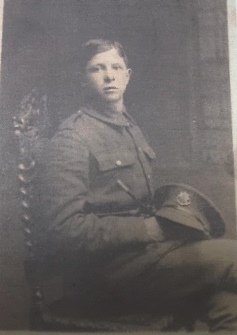 Joseph enlisted on 15th November 1915 and joined the Cheshire Regiment, serving with the rank of Corporal. His regimental number was 32605.Unfortunately his attestation and military records have not survived. 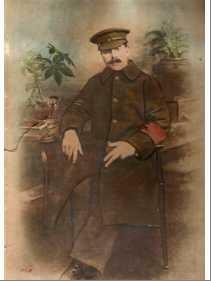 What is known is that Joseph was injured on 25th August 1916 possibly during the Battle of the Somme. He lost fingers on his left hand from a gunshot wound. He was evacuated to England and nursed at the Military Hospital, Edmonton, London. This was reported in the Manchester Evening News on Monday 8th October 1916. This photo of Joseph provided by his granddaughter was taken whilst he was in hospital and shows the disability to his hand. The red armband appears to signify that he was a patient undergoing treatment at this time. Joseph was discharged from the army because of his wounds on 19th January 1917.He was awarded the Silver War Badge and also received the Victory Medal and the British War Medal. Sadly Joseph’s wife Florence died in the summer of 1917 shortly after his return home. His family report that he moved back to Edmonton where had been nursed and in 1918 he married Sarah Agnes Chapman, a Queen Alexandra’s Nurse who had nursed him at the Military Hospital. Agnes was a widow with three young daughters. The couple eventually moved back to Altrincham with his son Joseph, Agnes’ three daughters and the three daughters they had together, settling in Oldfield Brow. Joseph worked a jobbing gardener after the war and may have struggled to find work. 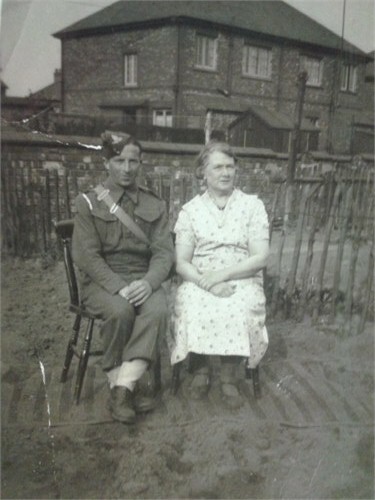 This later picture of him with Agnes kindly provided by Joseph’s granddaughter shows him in military uniform. He appears to have a prosthetic glove on his left hand. Joseph died on 22nd November 1937 aged 47 years. Sadly he was buried in an unmarked pauper’s grave in Hale Cemetery. Thomas Wyatt, born in 1893 was a jobbing gardener. He enlisted in the army at some point during 1915. His Medal Index Card indicates that he joined the Royal Field Artillery as a driver and entered France on 20th November 1915.His Regimental number was 35246. He was awarded the 15 Star Medal, the Victory Medal and the British War Medal .As the records have not survived it is not known when Thomas was discharged from the army, but it may have been before the end of the war as his death certificate describes him as a military pensioner and a jobbing gardener. He died in Altrincham General Hospital aged 27 years and was buried in April 1921 at the Blessed Virgin Mary Anglican Church in Bowdon. At the time of his death he was living with his father at 46 Chapel Street. The cause of his death was given as malignant cardiomyopathy. Frank Wyatt, born in 1891, joined the Cheshire Regiment in 1914 Regimental number 10293, although he was later transferred to the Devon Regiment, Regimental number 34061. This information came from the Medal Index Cards as like his two brothers, his attestation papers have been destroyed. Frank was awarded the Victory Medal and the British War Medal. It is not known where Frank went after the war. Research has been unable to identify any marriage or death records. Wyatt Family Photographs – Courtesy of Jane Southern.